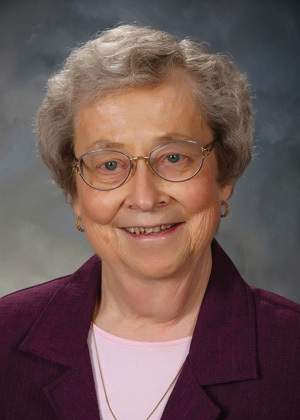 Sister Mary (Agnes) Crimmin, BVM died Sunday, Jan. 20, 2019, at Marian Hall in Dubuque, Iowa. Natural burial Rite of Commitment was Tuesday, Jan. 22, 2019, with burial in the Mount Carmel Cemetery. Memorial Mass and Sharing of Memories was Monday, Jan. 28, 2019 in the Marian Hall Chapel. She was born on May 12, 1935, in Chicago to Bernard and Frances O’Connor Crimmin. She entered the BVM congregation Sept. 8, 1953, from Our Lady Help of Christians Parish, Chicago. She professed first vows on March 19, 1956, and final vows on July 16, 1961. Sister Mary served the congregation as regional representative, assistant administrator of the Motherhouse, and BVM life facilitator for the Mount Carmel Retirement Community, all in Dubuque, Iowa. She served as parish minister at Our Lady Help of Christians in Chicago; St. Athanasius, in Evanston, Ill.; and St. Joseph in Crystal, Minn. She was an ESL teacher at Kankakee Community College in Kankakee, Ill., and an elementary teacher at St. Anthony in Casper, Wyo. ; St. Gilbert in Grayslake, Ill.; and St. Pius Chicago where she also worked as an adult education teacher. She was preceded in death by her parents, a brother Patrick, brother-in-laws Steve Morgan and Bob Wermes. She is survived by sisters Marcella Morgan, Elgin, Ill.; Loretta Wermes, Shorewood, Ill.; and Frances (Frank) Lyne, Wheaton, Ill.; nieces and nephews; and the Sisters of Charity, BVM, with whom she shared life for 65 years. (1) Mary’s ability to break into a song and dance, i.e. “Molly Malone,” “In Dublin’s fair city, where the girls are so pretty,” and we jumped into a 3-part harmony, that sounded like the “Andrews Sisters.” After long days of ministering with people in their homes, hospitals, nursing homes, neighborhood gatherings, wakes, funerals and burials, we appreciated hamming it up a bit! Besides that, it sounded great!! We had several songs we could do. (2) Something else that we did in our free time, was to regularly attend Israeli folk dance sessions at a ball room in Mpls. The movement and steps were such a mellow, prayerful source of inspiration that helped to rejuvenate us for our work. (3) I also recall Mary bringing home our Christmas tree one year, which was really quite a pathetic looking object. I don’t remember where she got it, but she said, “don’t worry! We will decorate it and it will be beautiful,” To this day I think of that statement every time I decorate our Christmas tree. Mary definitely helped me to appreciate the simple, unexpected, even broken parts of life and what a treasure they are or turn out to be. She is a dear friend and I miss her, however, I am quite sure, knowing Mary, that her spirit will pop up in my life, helping to keep me on track. Love you, Mary Crimmin, spelled C-r-i-double m-i-n! Everyone at St. Joe’s in New Hope Minnesota loved Mary. She was the eternal optimist and was one of the only ones that seemed to truly get the fact that our destination was not this planet but with God. As such she always had a smile and if she ever issued a discouraging word, we are not aware of it. Mary was kind, considerate, compassionate, and always concerned about the well-being of others. In other words, she molded what we believe the message of Christ was, and is. Just a great Christian lady, and we were proud to call her friend.